As of yesterday, this is how my garlic chives looked like. They were planted maybe three or four years ago still in the same pot. They are ready to be divided but I have been delinquent. Anyway, it looks very good at the moment. Garlic chives are different from the common chives (Allium schoenoprasum) by appearance and flavor. Sometimes they are referred to as Chinese chives or flat chives but in Ilocano (my dialect) they are called Kutchay. Unlike the chives, kutchay has a strong garlicky flavor which is an important material in my partly-Asian kitchen. It is good in fried rice, omelets, soups, meats, and noodles. The leaves as well as the young flowers make a good substitute for leeks, green onions, and sometimes cooked by it self. Garlic chive is a perennial plant that is easy to grow. I prefer to start with seedlings purchased local nurseries. Once established, it will continue to spread and comes back year after year. In fact it is a self-seeding plant thus can become a weed if flowers are not cut off before the seeds get dispersed naturally. I like to harvest them as needed starting from one end of the row or one side of the pot and moving on. This way there will always be new leaves to use in the kitchen since regular cutting or harvesting encourages new growth and even spreading. To harvest, cut the leaves 1-2 inches from the base. Annual application of compost early in spring will provide the needed nutrients. When grown in pots, apply complete or nitrogen fertilizer at a very low rate to replace the nutrients that get washed off during watering. Divide and replant when the plants get to crowded (maybe every three to five years). Self-seeding plants. (n.) plants with seeds that spread their seeds naturally and without special attention given, the seeds will grow. Start a kitchen garden...plant herbs. Mint must be one of the easiest herbs to grow. As a perennial plant, mint does not have to be replaced every season. In fact depending on your location it remains green throughout the year. I grow mint for adding to drinks, making cucumber sandwiches, yogurt sauce for Moroccan Lamb Kabobs, and garnishing. Peppermint (Mentha piperita) has dark green leaves with a reddish stem and lavender flowers. Chocolate Mint is a peppermint cultivar which had bronze-green leaves. Spearmint (Mentha spicata) has lighter green, pointy leaves and pink flowers. Apple Mint (Mentha suaveolens) has light green foliage. Pineapple Mint (Mentha suaveolens 'Variegata’) has green leaves that are banded with white. It has been my observation that mint undergoes two distinct growth phases in a given year. Understanding the events that happen during these phases helps a gardener grow mint the proper way. 1. The first phase is the above-ground vegetative growth which happens in early spring (see above picture). The stems will then prepare to flower in the summer. Frequent cutting will encourage branching and delay flowering. As the plant flowers, the vegetative growth comes to a halt to give way to reproductive development. 2. After flowering, stolons, which are modified stems, begin to grow laterally underground covering a lot of distance in a very short period of time. Eventually, these stolons will emerge from the ground and start to grow the next set of stems covering a much larger area. This is the reason why mint need to be contained. It is invasive and can become a weed. Dig into the soil at the base of your mint plant and look for stolons. Pull it out and cut into short sections making sure that there are at least three nodes in each section. I prefer the nodes that already have little buds and roots on them. Then plant the sections horizontally and cover with soil. Keep it watered but not too wet. In no time you will see new green leaves emerge. Propagate (v.) to clone or grow a new plant from a vegetative part of an existing plant. Stolon (n.) a modified stem growing underground. Distinguishable from the roots by the following: larger in diameter; white color; presence of nodes. I've always liked the way plants look when they are wet. Yesterday's weather made everything in the garden look wet. Although it did not really rain that much, it was misty throughout the day. After coming back from picking up my daughter from school I took my camera and captured some pictures. This is one of the rare occasions when the flowers and rain show up at the same time without the threat of a storm. The ornamental pear tree is one of the first trees that bloom early in spring. It is an excellent shade tree which offers beautiful autumn foliage. The Santa Rosa plum is great for eating and making plum sauce, which we like on pancakes. I have observed that although it blooms every year, we only get fruits every other year. Its blooming schedule coincides with strong rains and winds once every two years. Dwarf Periwinkle (Vinca minor) growing in between rocks. A long time ago I planted some dwarf periwinkle in my yard as ground cover. Over the years, I've replaced them with some other plants. These are some of the remnants from the original plants. No matter how I try to remove them, there's always a vegetative part that gets left in the ground, hence new plants arise. They are beautiful under control but my yard is too small for an invasive plant as this one. Stroll in your garden even in the rain; there are beautiful things to see there. Looking like a giant fan, this Ravenala madagascariensis, commonly known as the travellers palm, waves at every visitor, like me, at the Belize International Airport. When I saw it, I had to take its picture. 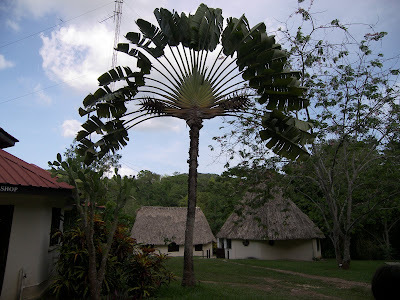 According to a guy we met in Belize, who eventually became our tour guide to Xunantunich the plant holds rain water in the folds of the leaf base and the flower bracts. Since the leaves are huge, they can hold up to a quart of water per leaf. 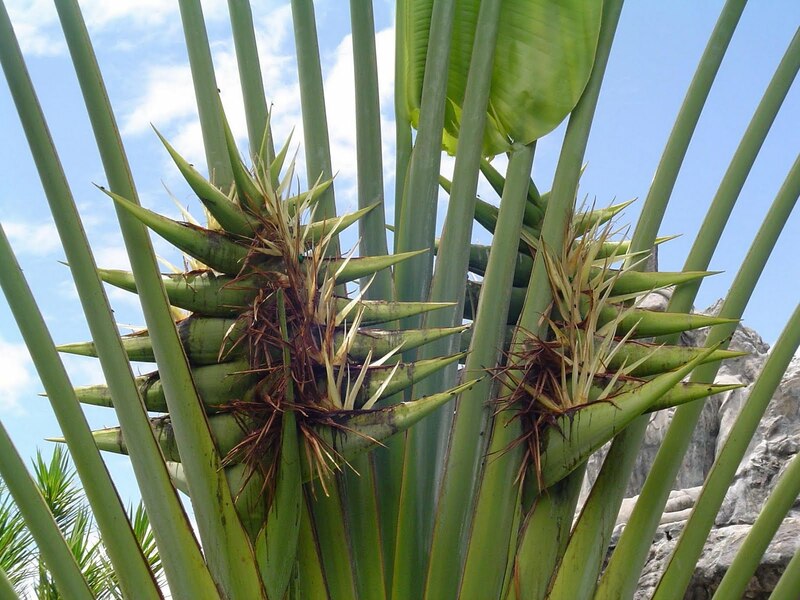 Back in those days when bottled water was not invented, the travellers palm was a natural source of water for thirsty travellers. That is the story behind its name. I am assuming, however, that they were source of emergency water when they are still small plants. It would be very inconvenient to chop down a huge tree just to get a drink. In spite of its name, the travellers palm is not a true palm. It is actually related to the birds of paradise (Strelitzia reginae) being in the family Strelitziaceae. It is unique that it is considered monotypic, meaning it is the only species in its genus. It is the only one in the genus Ravenala. The species name, madagascariensis, denotes that the plant originated from Madagascar. However, because of its unique characteristics and majestic form, people love it and so it has spread further away from where it all started. Sometimes pictures cannot explain the real experience, but these should be enough to tickle your imagination and provide information so that when you see one you'll recognize it. This pot is made from a "green" version of the traditional hypertufa. Hypertufa is an artificial rock made from a combination of natural aggregates (such as sand or Perlite) and peat moss mixed with Portland cement. My hypertufa recipe is unique in that it includes coffee grounds, portland cement, and water. The coffee material can be acquired free from Starbucks. It makes the mixture darker and a lot lighter (in weight) compared to sand. I was motivated to make small and unusual pots for my new collection of succulents. The rustic look of hypertufa would make an interesting contrast against their varying shades and shapes of the plants. I will continue to experiment on different coffee:cement ratio until I come up with a desirable combination. My first try was not quite successful as I skimped on the cement. Sometimes, the inspiration to create can be found in a garbage bag like the coffee grounds I used in this project. For as long as you can imagine then the possibility remains. After all, horticulture is not only a science but also an art. Sometimes flower varieties are not always indicated on their labels. For example, this orchid just came with the label "Cymbidium". In as much as I am planning to grow some more cymbidium this year, I did some research on the one that I already have. My closest guess based on flower appearance would be Cymbidium California 'Sun Acres'. So until proven wrong, I will assume that this is the variety I have. This orchid displays nice tall spikes of vibrant yellow-green flowers with lips that are ringed with burgundy markings. It is blooming now (February). We were spoiled by great weather this week with full sunshine and temperatures in the 60s (F). Today was different (cloudy and windy); it is supposed to rain soon but in as much as there are a lot of activities that I had planned to accomplish I enlisted Tim and Brahms to help me. These bricks were installed along an old pathway for the purpose of controlling erosion. The plum and peach trees are beginning to bloom. I'm hoping that the rain will come much later so that pollination will not be adversely affected. Sometimes the weather is an encouragement for gardeners to go work...sometimes it is a discouragement. Forgotten in a corner of my garden are two Cymbidium orchids. Tim had bought them for me years ago. Without doing my research I assumed that they were extremely sensitive to heat so I placed them in a shady corner of my garden where they hardly ever got any sunlight. Last year during the later part of fall, I moved them to the backyard where they got the southern sun everyday and got watered more often. The results are these stalks of flowers. I can only imagine what would have happened if I had taken the time to fertilizer them. These flower buds, called spikes, inspired me to do some research and in retrospect, analyze the cultural management I gave to my plants and their growth behavior. Right now I have more confident in growing Cymbidium...I've learned some lessons. 1. Differential Temperature. The differential temperature between the nights and days is the most important factor in flower initiation. Depending on the species there should at least be 10 to 20-degree differential before the spikes (these are the flowers) would start to grow. Where summer temperatures are high, air circulation plays an important role in alleviating the adverse effects of heat. 2. Maintained Moisture. Since orchids are tropical in nature, moisture should be maintained to optimize their performance. In places other than the humid tropics, watering or misting is a necessary part of orchid growing. Water frequently so as not to allow the growth media to get too wet. It is important to keep the roots cool or at least cooler than the existing atmospheric temperature. Watering need to be adjusted depending on the following factors: season, relative humidity, temperature, type of pot and type of media. 3. Regulated Light. As much as Cymbidium orchids love light there is also a limit to that. Unfavorable light conditions can be determined through the behavior of the leaves. Healthy leaves are shiny firm light green which curve outward gracefully. Yellow green leaves indicate too much light. Increase shade or move the plants where they get less exposed to light; Folding and drooping of the leaves indicate low light. Shading is almost always necessary during the hot summer months. Shading helps reduce evaporation and transpiration. 4. Less Amount and More Frequent Fertilization. Cymbidiums are epiphytic which means that they get their water and nourishment from the water vapor (in the air) that comes in contact with their roots. Fertilization is important especially during the growing period (warmer months). Applied fertilizer can be washed off easily with watering therefore it would seem practical to frequently apply small dosage of the nutrients. Some growers suggest once every ten days or three times a month. The use of slow-release fertilizer will effectively reduce the frequency of application. 5. Growth Medium. The two important characteristics of the growth media are good-moisture holding capacity and good drainage. Remember, the orchid gets the water from the air. I hope that I have inspired and encouraged some home gardeners out there to do an experiment with Cymbidium. After all they are easy and beautiful. Who knows, I too might buy another Cymbidium plant from Costco. Stroll in your garden, it's good for you and your plants. Currently there are three grapes Vitis vinifera growing in my garden. One of them is Pinot Noir and the other two are Cabernet Sauvignon. Although these varieties are commonly grown as wine grapes, my plants were originally intended to provide shade and these varieties were supposed to have beautiful colors in the fall. However, powdery mildew (Erysiphe necator) has always infected them late at the tail end of summer and therefore prevented them from showing off their autumn beauty. This pathological problem is worth noting nonetheless, they have always provided the shade which is very useful in this area and not only that they also produced enough grapes for making grape jelly that lasts us for more than a year. This season, a different variety of grape is going to be introduced in my small garden. Now that we have enough shade, I intend to produce grapes that we can eat in the shade without having to spit seeds in the process. The 'Thompson Seedless grape' is one of the most popular table grapes. Whenever I have a chance to stroll in a new place, I like looking at the gardens for inspiration and sometimes souvenirs. It is my observation that a unique plant often exist in any given area. During a family trip to the coast last week, I saw this plant in a lot of places including the gardens of the Mission in San Luis Obispo. It looked beautiful and it is one of the few exciting plants in February. It is commonly called "Fox Tail Agave" or "Swan's Neck Agave." Scientifically, it is known as Agave attenuata. This is a clone of that same plant and is now in my garden. I got it from the garden of El Chorlito Restaurant in San Simeon. I looked for the smallest plantlet hidden underneath all the bigger leaves that's why it looks pale. It will be interesting to see how it will do here away from the coast. By the way, the food at El Chorlito was great! You also enjoy the great view of the ocean while you dine. I thought I needed to say this blurb as a way of expressing my gratitude for the free plant souvenir from their garden. My lawn is just beginning to show signs of new growth. I like to leave it unwatered and unfertilized during the winter months. Low temperatures during this period induce the grass to undergo some period of dormancy; in California this period short. Last week I applied a minimal amount of nitrogen to boost the initial growth slightly. I used 30-0-4 containing 1.29 percent pendimethaline, a pre-emergent herbicide. Pre-emergent herbicide arrests the emergence of weed seeds. Since it works only on seeds, timing is very important consideration in its use. Heavy rains during application can diminish the effectiveness of the herbicide. 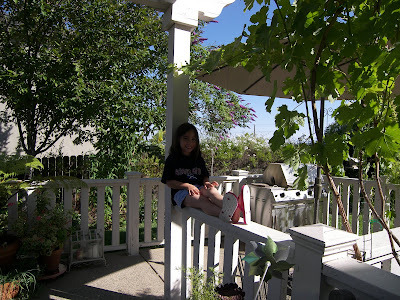 March 15 is the recommended time for spring-application but in California it could sooner. Last year I was late; some of the weeds already emerged when I applied herbicide. The weed population was reduced but not totally eradicated. That's why I'm experimenting this year on an earlier schedule. I got a bareroot plant material for pomegranate (Punica granatum L. 'Wonderful') waiting to be planted in my garden. One problem remains - finding a place to plant it. I will soak the bare root in water in the mean time to hydrate it prior to planting. Pomegranate is supposed to be heat and drought tolerant which makes it a good plant for our area...also, they say that the variety, 'Wonderful', is highly adapted in California. According to California Rare Fruit Growers, the variety 'Wonderful' is a vigorous and productive. Because of that, it has become the leading commercial variety in California. It originated in Florida and was first propagated in California in 1896. The fruits are large, deep purple-red, with medium thick tough rind. The flesh is deep crimson in color. It is juicy and of a delicious vinous flavor. Soon I will have the chance to see and taste it from my own tree. The name pomegranate comes from the Latin words pomum (apple) and granatus (seeded). So pomegranate means seeded apple. The plant is a beautiful tree and the fruits are nutritious and decorative. 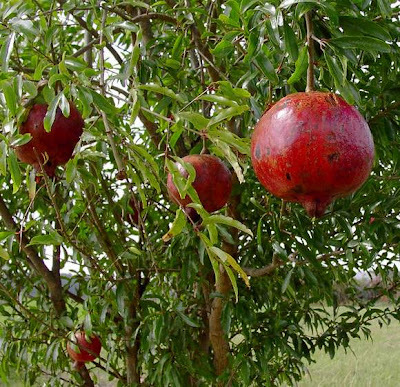 It must have been cultivated thousands of years ago since the Old Testament bible talks about pomegranate in many occasions as a part of a decorative design on the garments of priests (Exodus 28:33). It must also have been grown and consumed in Egypts as part of their diet. This is evidenced by the fact that the Israelites when they were led out of Egypt complained about the lack of grains, figs, grapevines or pomegranate (Number 20:5). In California, pomegranate was introduced by the Spanish settlers in 1769. Anyway, that's just a tidbit of information on this plant that will soon become a part of my garden. As a general rule, I start pruning roses in mid-January till February depending on the variety and the prevailing weather conditions, which can vary from year to year. Some varieties break dormancy earlier than some. It is a good idea to start pruning the early ones and finish with he later varieties. Last week I started pruning roses in my backyard. The ones in the front of the house still need to be pruned but since they are mostly climbing roses, pruning is not so critical at this point. As opposed to traditional beliefs, roses are very hardy and forgiving plants. There are hundreds of rules everywhere on how to prune roses. For the last fourteen years that I've tended roses in my own garden, this is the one key lesson I've learned about pruning: The height and angle of the cut, the direction of the bud next to the cut, and even time of pruning does not really matter in the overall growth and performance of the rose. Therefore, instead of describing a standard procedure here, I am going to explain the reasons for pruning. Anybody who understands these reasons will eventually learn how to prune. 1. To increase plant vigor. Unproductive canes are dependent on the healthy ones for their maintenance. Removal of the diseased, small and old (brown instead of green) canes will result in a healthier plant. Not only will the plant look cleaner but it will also have less chance of infection from the same diseases that infected the previous years' growth. 2. To increase and prolong flowering period. Pruning encourages the growth new canes. Younger canes tend to have a vigorous growth resulting in more branching. Since flowers appear on new branches, more flowers will be produced. Eventual pruning, also known as dead-heading, will have the same effect of encouraging further flowering. 3. To train the rose to desired shape and direction. Roses are planted for different purposes. Some are grown as accent plant, climber, ramblers, or in beds as in botanical gardens. In general, roses are pruned to have an open vase-shape allowing the canes to grow slightly outward as in the letter V.
Ramblers and climbers are pruned to train and guide the canes to follow a specific direction as is growing to cover an arbor. Once they are established, pruning will be done to maintain the shape and remove dead and damaged branches. New canes will grow and if they are not wanted, be ruthless to cut them off. Some climbers, such as 'Cecile Brunner', are very aggressive that if you allow them to grow without intervention, then you are setting yourself for a mega-pruning job in the future. 1. Equip yourself with very sharp pair of shears. They will make life easy for you and your roses. 2. Protect yourself with heavy duty gloves to avoid unnecessary cuts and scratches. 3. Choose the canes that you want to remain. Consider vigor, position, and age of cane. 4. Remove all unwanted canes and dead wood. 5. Cut the remaining canes to desired height. For taller roses, prune higher and vice versa. 6. Remove all old leaves from pruned plants. This will trick the plant into believing that it has gone through dormancy and now it should start to grow. What Do Fertilizer Labels Mean? Commercial fertilizers, by standard, contain at least one of the three primary nutrients (N), phosphorous (P), and potassium (K). Phosphorous and potassium in their elemental form cannot be absorbed by the plants. In fertilizers they come in a form that is useable by plants. Phosphorous comes in the form of phosphate (P2O5) while potassium comes as potash (K2O). Fertilizer qualifies to be a commercial grade only when it contains more than five percent of N, P2O5 or K2O. Every bag of commercial fertilizer is labeled with three numbers separated by dashes as shown in the above picture. These numbers reflect the percentage of the three primary nutrients in the fertilizer, the first number being nitrogen (N) - the second number is phosphate (P2O5) - the third number is % potash (K2O). The label always lists the nutrients in this order. 16-20-0 is a fertilizer containing 16% nitrogen, 20% phosphate, and 0% potash. Mixed fertilizers (fertilizers that contain two or more of the primary nutrients) either complete or incomplete, are made by combining different single-element sources to form a desired blend. Because of this combination, the resulting fertilizer mix may have particles of varying colors. In as much as plants require different proportions of the primary nutrients, manufacturers produce different grades. 6. The total amount of nutrients in the 50-lb bag of fertilizer is 13 lbs. The rest is inert filler material. 7. To convert phosphate into phosphorous and potash into potassium the following conversion rate are necessary: 1 lb of P2O5 = 0.44 lbs P; 1 lb of K2O = 0.83 lbs K. So, we already know that there are 5 lbs of phosphate and 5 lbs of potash in a 50 lb bag of 6-10-10. To convert phosphate in to P: multiply phosphate weight by 0.44 lbs. It is important to master this simple math skill because it is a tool in determining the economics of your choice of fertilizer. To appreciate and understand the meaning of the fertilizer grades, one must understand the functions of the elements that are featured in the fertilizer labels. Nitrogen (N) is the major element that affects vegetative growth of plants. Sufficient nitrogen results in good foliage which key to producing a good crop. Nitrogen is a major component of plant proteins, chlorophyll, vitamins, and enzymes. It is gives the green coloring of the plant. When nitrogen is deficient, plants exhibit stunted growth, chlorosis or yellowing on older leaves, premature death and poor yields. Nitrogen is a plant-mobile element, therefore the symptoms of deficiency are observed on the older leaves. Phosphorous (P) promotes early root formation and growth. It is a component of some enzymes and proteins, ATP, RNA and DNA necessary for plant development. Phosphorous also promotes healthy development of the reproductive system of the plant. When we say reproductive system we are referring to the flowering, fruit setting and seed development. Deficiency on phosphorous is manifested by stunted growth of plants, unusual dark green and purple pigmentation on leaves, poor fruit and seed development, and delayed maturity. Unlike nitrogen, phosphorous is an immobile element hence, the deficiency symptoms are usually noticed on the younger plant parts. Potassium (K) is necessary in the following plant processes: formations of sugars and carbohydrates; protein synthesis; and cell division. It is enhances flavor and color on flowers, fruits, and vegetable crops. It also helps increase fruit size and quality which results in better marketability of produce. Potassium helps build resistance of plants to diseases. Plants that are deficient to potassium exhibit the following symptoms: slow growth resulting in low yields; scorched or burned appearance on leaves; necrosis on mature leaves; weak stalks resulting in lodging; and small fruits and shriveled (undeveloped) seeds. Therefore a fertilizer that has the label 6-10-10 (6% N - 10% P -10% K) is intended to promote a healthy plant growth giving special emphasis on root and fruit development just like what a gardener would on his tomatoes. On the other hand, a fertilizer with a label of 21-0-0 (21% N and 0% P and K) is intended to meet the needs of a plant to develop healthy foliage. It is usually applied on lawns and non flowering and fruiting shrubs. The fertilizer 16-20-0 is a formula that's used to provide nitrogen and phosphorous needs of plants. The emphasis here is foliage growth and root and flower formation. This also can be used in areas where K is needed but the soil has sufficient amount of K2O. 1. Have your soil analyzed. Soil analysis result will give you a customized fertilizer recommendation for your garden. Collect soil samples. Assign five locations that represent the different sections of your garden. Collect soil by cutting straight into the soil up to about one foot deep. Avoid scraping only from the top soil. Air-dry soil samples. Mix a you pulverize the samples. Put them in a bag and send them to a soil analysis lab in your area. The soil in general contains all the essential elements for plant growth. Some elements are more abundant than some. Nitrogen, because it is absorbed by plants in large quantities, and can be lost easily through leaching and immobilization, needs to be replaced more regularly than P and K. Phosphorous is often bound in the soil due to soil unfavorable soil pH (soil acidity). Water plays an important role in making the elements available for plant uptake. Fertilizers are like medicines. They are helpful in the right amounts but can be toxic beyond a certain level. Addition of any element to the soil will result in a change in the soil chemistry. Sometimes, too much of one thing will bind other element making them unavailable for the plants thereby solving one problem by creating another. Always follow the recommended rate and procedure of application. Now that you know the meaning of the labels, you should be able to determine which bag gives you the nutrient at the least cost per unit weight.